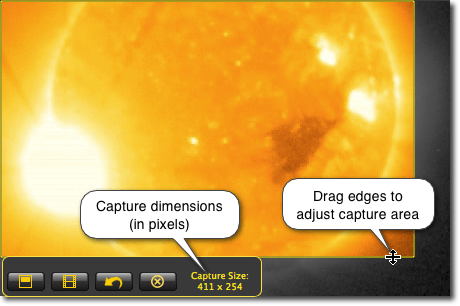 Jing can capture your entire screen, a window, or a specific area of the screen you specify. Click Capture (or use a capture Hotkey) to initiate the capture process. If you have multiple windows on your screen, notice how certain areas will be brighter than others as you move your mouse around the screen. Jing will capture the bright (non-dimmed) area of your screen. To specify a capture area, click and drag the mouse. You can select a rectangular area of your screen to capture. Once the area is highlighted, you can adjust the size by clicking and dragging the borders of the capture area. 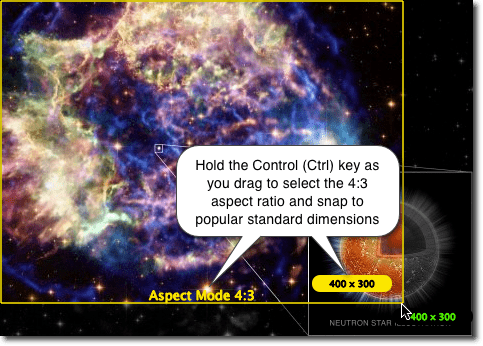 Hold the <Ctrl> key or <Shift> key as you drag to snap to standard dimensions. Holding Ctrl locks to a 4:3 aspect ratio and Shift locks to 16:9. This means there are 4 pixels in width for every 3 pixels in height, and likewise, 16 pixels for every 9 in height. Who cares? This is particularly handy if you are working with video editors or websites that require one of these standard ratios. Videos that don't comply will often have black bars or may appear squished or stretched. Screencast.com does not resize your content.